November | 2012 | Where is Yvette? 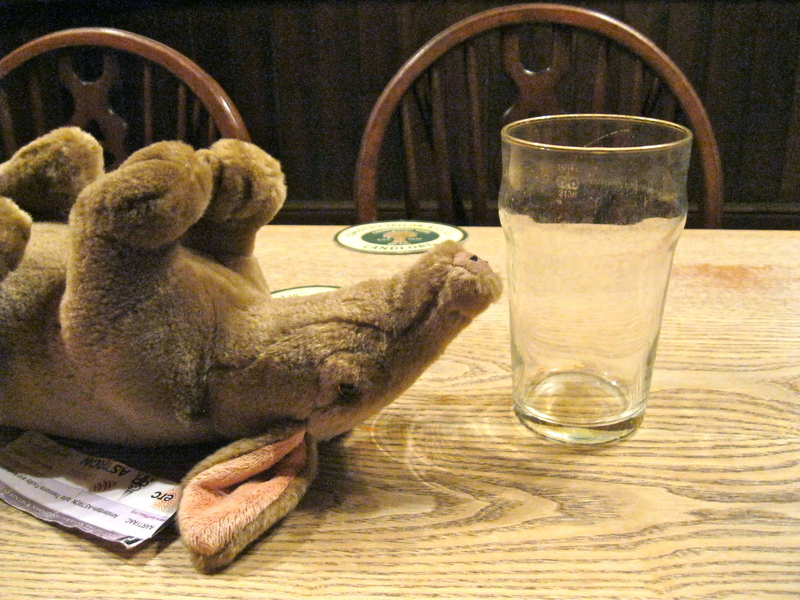 Continuing our series of our lovable scamp exploring various interesting astronomical locations, Artie Aardvark has graciously agreed to cover a recent visit of mine to University of Southampton. Take it away, Artie! I was very excited to go to Southampton! People told me it would be rainy in England, but the weather was actually very nice. Here I am making friends with the ducks in Southampton Common on my way to the university. Once I arrived, it was time to help with work. Most astronomers these days do not work at their observatories most of the time but instead get their observations and spend months or even years analyzing them. I suppose this is nice because then you don’t have to spend all of your time in the middle of nowhere anymore! Here I am working on the code for a particularly troublesome data set. Later in the afternoon, however, it was time for a break to explore the University of Southampton campus! We of course first stopped at the LOFAR antenna next to the physics building- it’s not a real antenna, but a pretend one to show you what they look like. It is kind of funny to think that a metal pole in the ground is a radio astronomy antenna because I thought they looked more like the Westerbork ones I visited once, but it turns out what really matters is what wavelength you are looking at. Radio frequencies all have a matching wavelength that can be anywhere from sub-millimeter to longer than a football field from their peak to trough, similar to how waves in the ocean can sometimes be very tiny and sometimes very giant. The wavelengths LOFAR is interested in are about as long as this pole, so that’s how big the antennas are- the fact that they are cheap to build helps too! After that, I also enjoyed exploring the Southampton campus because it was very green like a giant park. In fact, it was quite the jungle in some places! It was really fun to explore all the plant life and clamber around for tasty bugs, and… oh no! I’m stuck! Yvette, help!!!! When I woke up later I’d missed out on a lot, and boy did I learn my lesson! So even though there was real Duff beer to be had during the Simpsons Treehouse of Horror marathon on Halloween I didn’t have very much of it. Thanks to everyone in Southampton who helped me with the pictures! It is a curious general rule of the world that every nation I’ve ever heard of has a special holiday dedicated to fire and blowing things up. I’m not sure why this is, but my best theory is that most people are closet pyromaniacs and it’s best we indulge in this bit of fun on a regular basis lest we snap and set fire to something that actually matters. Like in any sport or hobby you play against yourself, after a certain point a person engaged in it begins to seek handicaps in order to keep the game interesting. For most travelers that involves going to adventurous and far-flung locations (“you mean you’ve never been skydiving in South Sudan? !”), but when you’re in a place like Italy where one often sees more tourists than locals it can be a little difficult to get off the beaten path and keep things interesting.